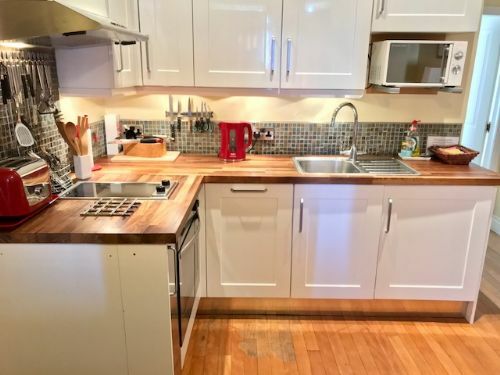 Charming ground floor apartment with sea view all on one level paces from Pittenweem`s picturesque harbour with own entrance and completely self contained, ideal for couples, private patio with wonderful sea views and wood burning stove for those cosy nights in. Small dog permitted by prior arrangement and wireless internet provided. All rentals include the provision of good quality bed linen and towels. Please note that for any one with mobility issues there are two small steps at front door into the house and two steps from decking down to patio area. Rachel and I had the most wonderful holiday at the Wee Net house. The week was absolutely perfect and the accommodation could not have been better! The new neighbours and people in the village were extremely friendly which really added to our enjoyment and made us feel incredibly welcome. the Wee Net House had everything we needed and we loved the view from the terrace. We spend every morning out eating breakfast looking out to sea and enjoyed or evening meals out there too. We swam every morning in the tidal pool along the coast and felt very much at home. Perfect place, Perfect location, Perfect Holiday. I very much hope we may be able to book with you again or even move to the area some time in the future. Thank you so much again for your hospitality. A lovely house - everything we needed for a relaxing stay. Thank you we will return I hope! Another excellent, very comfortable stay. Fantastic weather & dolphins. Bliss!! Thank you and just to say we had a lovely stay once again . It is a lovely little house . Beautiful flat, very peaceful, perfect!! 1st time for a holiday in Fife. House is beautiful, well equipped, fantastic views. Had a lovely weeks holiday. First class holiday home. Enjoyed coastal walks to Anstruther - St Monans. Tennis, golf in Elie. A visit to Crail a must. Had a great week, weather and accommodation excellent. Simply loved it, especially the sea view!!! Thank you! Total relaxation in beautiful surroundings. Thank you! Second time at Little Net, loved every minute. House is like a home from home. Will defo be back! First time on holiday in Fife. House is beautiful, well equipped, fantastic views. Had lovely weeks holiday! We had a great time in this house. The location is great and it is a real home from home. Best fish and chips ever from the local chippy, hope to come back! Don’t want to go home. Perfect house in a perfect location. Have never felt so relaxed, will almost certainly be back, thank you! Excellent accommodation, fab weather, delicious fish suppers!! Had a lovely experience this morning – we were sitting on the deck eating our breakfast in the sunshine when we spotted dolphins cavorting right in front of us. This is our 7th holiday on this bit of coast and the first time we’ve seen dolphins – such a treat!